To celebrate the final weekend of the inaugural MPavilion program – an initiative of the Naomi Milgrom Foundation – Natalie King (Senior Research Fellow, VCA) and Kelly Fliedner curated a marathon 12-hour conversation relay, lasting from 11am to 11pm on Saturday January 31, that mirrored the programming rhythm of MPavilion. Here’s their story. Designed by Melbourne architect Sean Godsell, MPavilion was a temporary home to free public program of workshops, talks, interventions, and soundscapes, situated in Melbourne’s Queen Victoria Gardens. MRelay was a gesture to bid adieu to MPavilion by keeping conversations alive. Curated around four tenets; Pavilions, Intimate Publics, Dreaming and Nocturne, we brought together leading thinkers, philosophers, politicians, fashionistas, mavericks, activists, provocateurs, architects and doyennes in the hope that the frisson generated from their cross disciplinary knowledge would uncover interesting ideas. We invited 30 speakers to participate in rapid conversations, firstly interviewing a fellow guest for 15 minutes, and then passing the relay baton along and being interviewed by another guest for 15 minutes, forming a 12-hour chain. Each segment was hosted by a different person who guided the unfolding conversations. 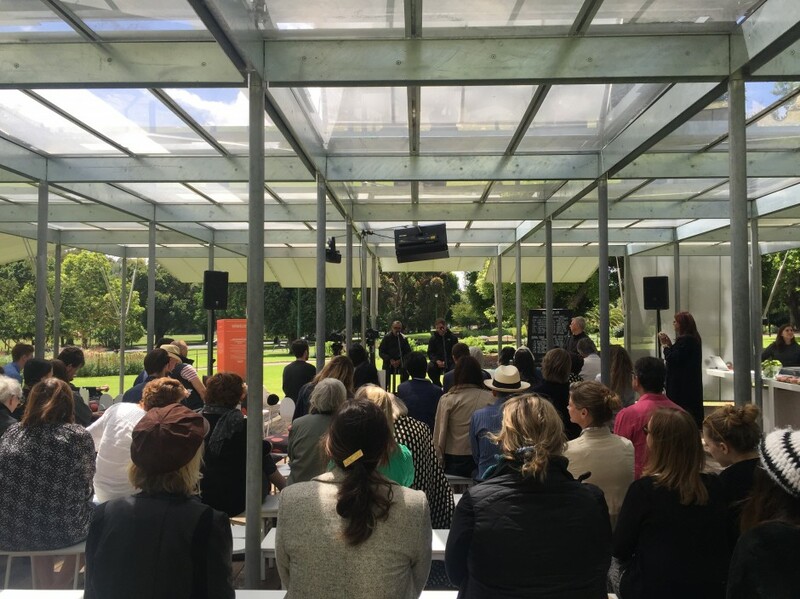 It was a fast-paced experiment, a little exhausting, definitely interesting, and the perfect way to celebrate the end of the MPavilion. Dreaming, hosted by Yorta Yorta soprano Deborah Cheetham, Associate Dean (Indigenous) at VCA & MCM contemplated the role of dreaming and imagination and wrapping up the final session, Nocturne ruminated on what transpires under the cover of darkness. Over the course of the 12 hours, we heard Sean Godsell discuss the importance of civic design that recognised the interplay between public and private, Christine Nixon, former Chief Commissioner of Victoria Police and architect and urban designer from the City of Melbourne, Rob Adams spoke of the importance of engendering ownership of our streetscapes to create safe communities. Indigenous historian/activist Gary Foley enlightened us all on the genesis of Australia’s most famous and likely most important pavilion, Canberra’s Aboriginal Tent Embassy, and Melbourne Business School Professor Robert Wood spoke of literal proximity as an intimate act that varies from culture to culture. The last sessions of the marathon touched upon how the days of the solo working practitioner were over, how working collaboratively changes the way we communicate with each other and broadens the tools at our disposal, and revealing the alluring darkness, sinister and radical aspects of the night. Thanks to the support of the VCA and MCM’s New Initiatives Fund supported by the State Government through Creative Victoria, we are now looking forward to launching a full series of videos created by Elizabeth Klaus and Matt Harding that document each (and every) part of MRelay. These will be posted to the MPavilion website and on our social media channels. Stay tuned and thanks to everyone who helped and attended!